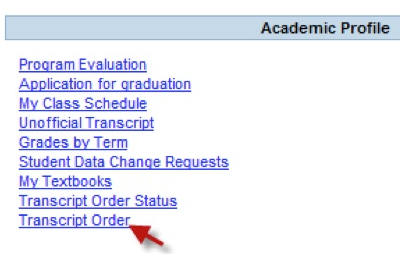 Select the Transcript Order option under the Academic Profile area. From this screen, you will choose the appropriate sending option for this order. To send a SPEEDE transcript, you will need to check the box beside "Check here to view and select from all institutions using electronic transcripts". Then click Submit. Once you click submit a new window will open with a list of the trading partners. 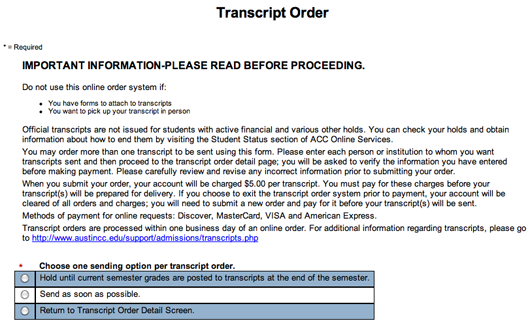 Select the institution(s) you would like to send your electronic transcripts to for this order. 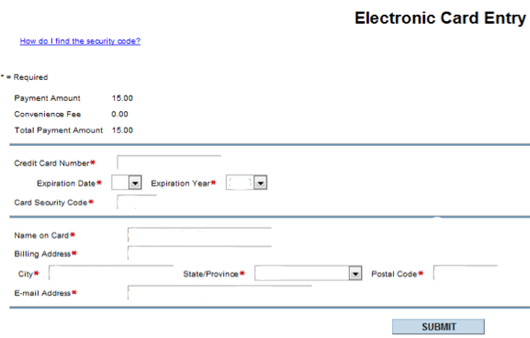 Click on Submit to move to the next screen, Transcript Request Detail. To send an official paper transcript, select Option 2. You will enter the name/address of the institution or person you wish to receive the transcript. Once name/address information is entered, click on the Submit button to move to Step 4: Transcipt Request Details. Transcript Request Detail: Verify that your information is correct. Click on Submit to proceed to the "Pay on my Account" screen to begin the payment submission process. If the request is incorrect, delete request and start over. Enter Payment Type and click on ‘Submit’ to go to the payment screen. Enter payment information and click on ‘Submit’ to process. Transcript Order Status screen from Student main menu.